We work with a variety of non-profit, for-profit, professional services, and the most reputable organizations in the region. Our goal is to strategically partner with these organizations in order to improve and add value to our industry and services with the ultimate goal of being better able to support our clients. We understand that networking and nurturing new connections is essential to the way we do business. But more importantly, we recognize the importance of increasing the visibility of key roles throughout the industries we serve. Each organization has been carefully chosen to help us meet the goals of our employers and candidates as well as provide professional growth, educational opportunities, and networking experiences. Our involvement can in part be measured by the success of our fellow members and the growth of our targeted industries. The American Staffing Association (ASA) promotes legal, ethical, and professional practices for the $61 billion U.S. staffing industry. Millions of Americans go to work for U.S. staffing companies every business day. Founded to promote flexible employment opportunities and ensure the quality of staffing services, ASA has been the voice of the U.S. staffing industry since 1966. ASA and its affiliated chapters promote the interests of the industry through legal and legislative advocacy, public relations, education, and the establishment of high standards of ethical conduct. Whether it's participating in a competitive golf game, helping The Greater Boston Food Bank, or serving meals at the New England Center for Homeless Veterans, we have enjoyed each and every event that we have attended as a Business Partner of the Association of Legal Administrators- Boston Chapter (ALA). As part of their goal, the ALA provides personal and professional development opportunities to Administrators and Legal Managers with varied legal backgrounds. In addition to this, the ALA informs the legal professionals about the advantages and availability of Professional Administrators. Founded in 1986 and with more than 2,000 members, Northeastern Human Resources Association (NEHRA) is the largest, most influential professional HR organization in the Northeast. NEHRA's goal is to help HR professionals Connect, Grow and Thrive by providing relevant and timely educational programs, access to tools and resources, and a myriad opportunities to network with peers. The Greater Boston Chamber of Commerce is the region’s most extensive business network, connecting more than 1,500 businesses of all sizes from virtually every industry and profession. They are an independent, non-profit organization that is the convener, voice and advocate of our region's business community. Their purpose is to "Make Greater Boston the best place for businesses and people to thrive." The GBCVB is a not-for-profit, membership-driven sales and marketing business comprised of over 1,200 companies across New England that depend upon the visitor and convention industries for their own success and growth. 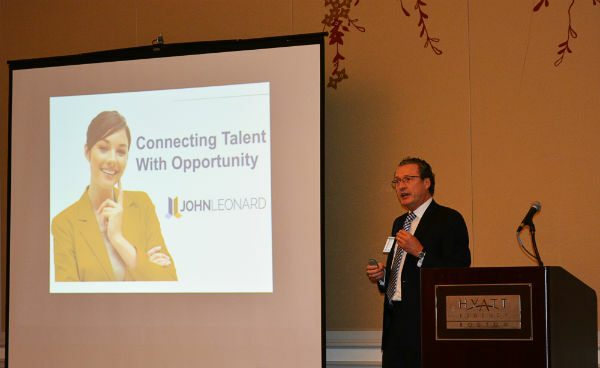 JOHNLEONARD puts your future first.